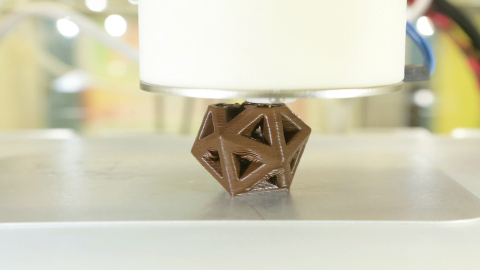 Design your chocolatey indulgence with 3D printing of Hershey’s chocolate, who took its advanced technology CocoJet 3D printer to exhibits throughout the US to prove to fellow chocolate lovers that their chocolate is future-proof. Chocolate lovers are invited to select 3D printing graphics on an iPad, including intricate lace patterns and complex hexagons. Or, upload your own design (like your image) via the open-source capabilities to the CocoJet and watch your designs come to life! Hershey’s technology marketing executive, Jeff Mundt, explained that while it’s complex to create a figurine, it is possible, theoretically, to replicate yourself as a chocolate replica! 3D printing is an advanced solution for printing materials including plastic, metal, ceramic and edibles (like chocolate). 3D printing is also being used in the healthcare system for end-to-end simulation, training and integrated planing for case-by-case surgeries and advice. Technological advances like 3D printing is empowering world devices, prototypes, communications, plans and helping us to design our own futures. We understand the power of now how to get your business from simply here to where you want to be. Our advanced online marketing techniques will take you from strength to strength, measurable against your KPIs. Talk to us today.